For first-rate seamless gutters for your home in Deerfield, Wisconsin, or any surrounding community, turn to the gutter installation experts at ABC Seamless Home Specialists. We offer high quality, seamless steel gutters that are fabricated right at your home, using the precise dimensions of your roofline for an exact fit. Your new gutter system will be maintenance free and, because of the superior coating we use, will never fade or get chalky like lesser quality aluminum gutter systems. Having us install your new gutter system means you will never have to paint, scrape, or otherwise beautify it again. 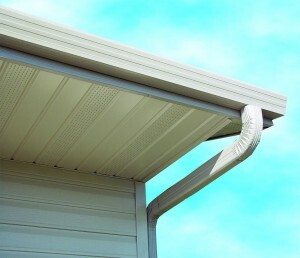 Appearance – Our gutter system is designed to blend into your existing soffit and fascia for a cohesive, finished look. Performance – Our gutters carry away up to 23 percent more water than standard gutter systems. Convenience – Our designer gutters feature durable downspout extensions that can flip up when it comes time to mow and are longer than average to carry water further away from your home’s foundation. Plus, you can feel good about having ABC Seamless Home Specialists install your new gutters, or handle any other exterior renovation project you may need. We’re a family-owned and -operated company serving the region since 1975, offering American-made products installed with American pride. We offer a lifetime, transferrable warranty and a 20-year, 100 percent workmanship warranty – the best guarantee in the business that backs the gutters and other products we use and the work we perform. In essence, everything we touch is covered for life, so you can rest easy knowing that with ABC, your investment is protected. For more information on our seamless steel gutters for your home in or near Deerfield, WI, contact ABC Seamless Home Specialists today.